E3 2018 has a lot of big games occupy the show floor from well-known developers. However, in the past few years, independent games have garnered some spotlight at the gaming convention. One game to grab a lot of attention this year is My Friend Pedro. 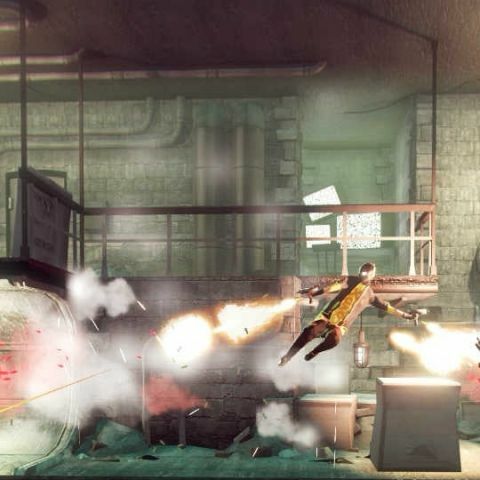 The game is a 2D shooter with Max Payne like bullet time thrown into the mix. The action in the game is fast paced and the kicker is that your friend aiding you in the game is a banana. A kicker is that the game is solo-developed. The 2D side-scrolling bullet-time game has you platform through buildings, across rooftops, navigating using a skateboard and even riding a motorcycle. The game is acrobatic in nature as you can pull off some insane flips and wall jumps all while wielding two guns to take on your enemies. The amount of bullet time in the game is generous and it looks like the developer wants you to have fun rather than worry about resources. You can also use certain surfaces in the game to ricochet bullets into your enemies. At times, you can kick a frying pan into the air and ricochet bullets off it to hit multiple enemies. From the gameplay trailer we’ve seen, the game looks fast paced, addictive and above all a whole lot of fun. Information flowing in from E3 suggests the game will be under 7 hours long and gamers will be able to revisit levels to get a better score. There is no information available whether My Friend Pedro will launch on the Xbox One or the PS4. No concrete release date for the game has been announced apart from the year which is 2019. We got to see a lot of awesome games at E3 2018 and you can check out our coverage of the Microsoft, Sony and Bethesda conference to know the games announced.